« Fish’s Eddy Huge Sale! 1. 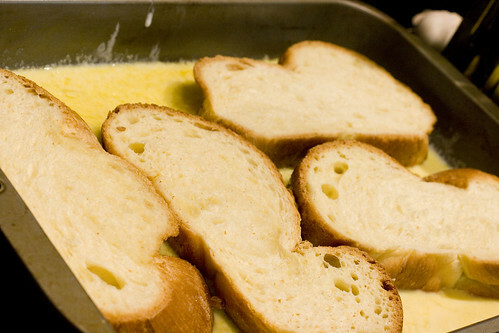 In a pan or dish large enough to hold all the bread in one layer, whisk together eggs, buttermilk, sugar, and salt. 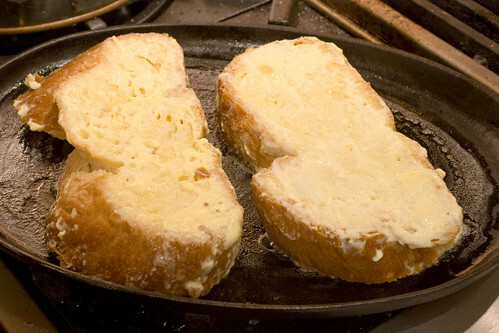 Lay the Challah flat in the pan. Let it sit for 30 minutes. Turn it over and let is sit for another 30 minutes. 3. When the challah is golden on one side, flip one piece over. Spread 1 tablespoon of mustard on. 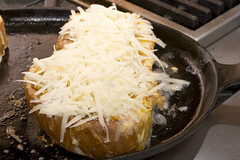 Sprinkle 2 ounces of gruyere. Lay on ham. Sprinkle with black pepper. Place the other piece of challah on top, uncooked side facing up. 4. 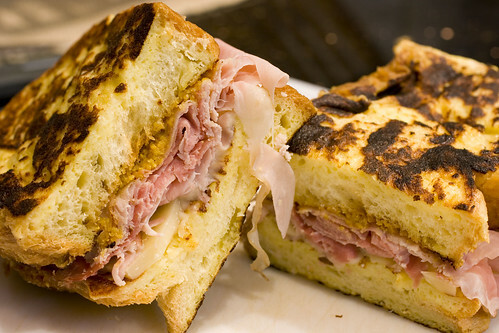 When the bottom is golden, flip entire sandwich over to finish the last side. When the last side is golden, remove from heat and cut in half. 5. 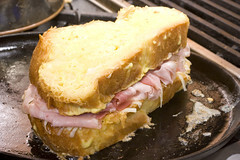 Repeat with the remaining ingredients to make another large sandwich (again cutting in half to make two). posted by jessica	at 03:26 PM	Filed under French, Recipes. You can follow any responses to this entry through the RSS 2.0 feed. Both comments and pings are currently closed. I wanted to add in a comment or two just about the taste of this sandwich. It was ridiculously good. Jessica and I sat around moaning about the flavor. 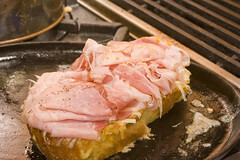 It is a bit sweet from the french toast and the mustard, a bit salty from the gruyere and ham, a bit tangy from the mustard and the pepper, it’s rich from the ham and the egg, and each bite melts in your mouth from the challah and the cheese. Oh man, seriously, it has everything. This has got to be the winningest Grilled Cheese sandwich for Grilled Cheese month. 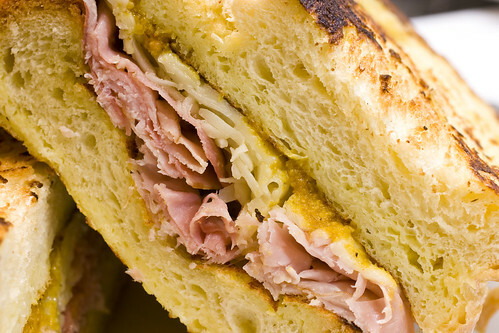 Now this sandwich, mmmm mmmmm mmmmmm, looks absolutely delicious, wow. oh wow – there’s this french bakery/cafe here who features the croque monsieur… i’m sure yours would beat theirs by a mile! 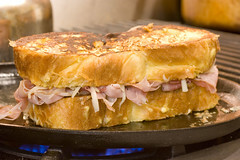 MMMMMM….wow, this new croque monsieur sure gets my vote! yummie twist!! Fabulous! Thanks for the recipe. so THAT’S what a perfect breakfast sandwich looks like. good to know. This is a serious eggy bread recipe Jessica! !